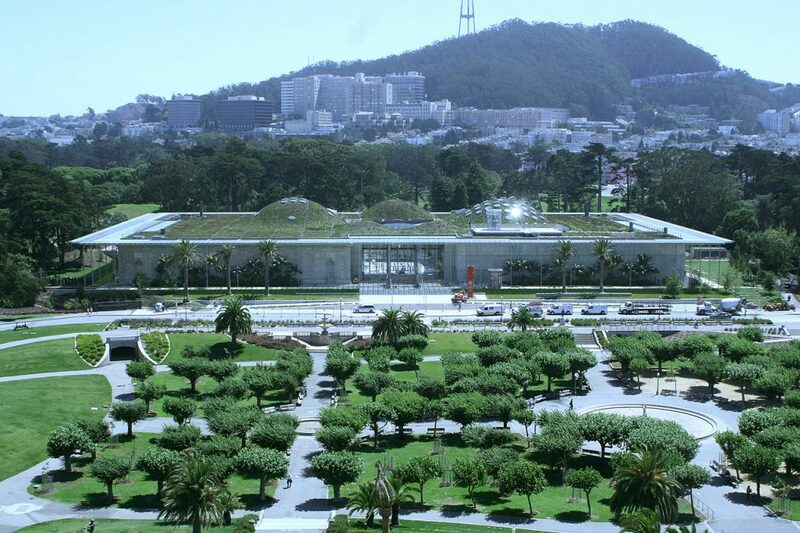 Renzo Piano is a Pritzker Prize winning architect well known for his futuristic public spaces. Piano has mastered the art of adapting to the need and context of any space and with work ranging from museums to sports stadiums to courthouses, he doesn’t limit himself to a certain type of project. He believes that light is just as important to the design as shapes and volumes and incorporates that belief through showcasing transparency and light in his work. The Old Port in Genoa, Italy encompasses the essence of Renzo Piano. The entire project is composed of three elements, the Bigo, Biosfera, and aquarium. His structures transformed the formerly inaccessible port into a thriving tourist attraction that displays the beauty of the city. Following Piano’s theme of transparency, the aquarium features large glass walls that make you feel as if you are underwater. 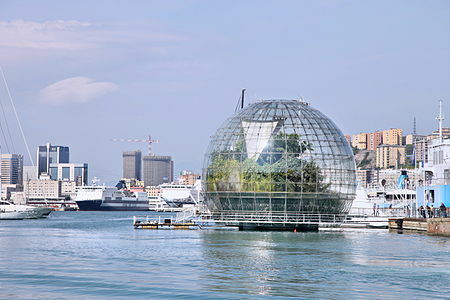 More transparency is displayed in the Biosfera, a glass bubble of tropical forest on the edge of Italy. The oceanic motif is concluded with eight mast-like arms, comparable to dockside cranes, that support the covering of an open-air auditorium and a lift that reveals the breathtaking view of the port’s surrounding landscape. 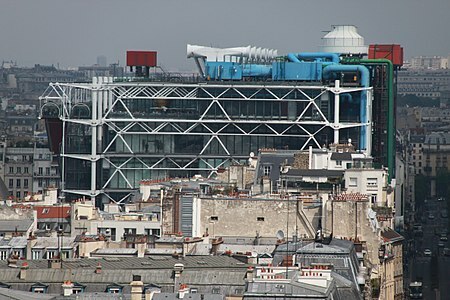 Piano landed the Centre Georges Pompidou job with his innovative, competition-winning proposal. Renzo teamed up with Richard Rogers to create a design that allowed full use of an extensive, open interior. To create such an expansive space they housed the elements usually found behind walls, on the outside of the building. The exterior is a display of color coded ventilation, stairs, elevators, plumbing and electrical components. The interior consists of a public art museum and library. Western Europe’s tallest building, The Shard, is a versatile tower containing a hotel, spa, office space, apartments, and retail areas. Featuring signature elements of Renzo Piano’s work, the structure is an open-top spire made up of glistening glass shards with a space dedicated to taking in the view of London and it’s famous Thames River. In true Piano fashion, Renzo makes his official residential debut in the U.S. with a grand, environmentally inspired, luxury condominium in Miami. These organically designed, oceanside apartments are housed in a transparent, balcony wrapped high-rise and include a record breaking penthouse. They embrace Piano’s integration of light and nature by using floor to ceiling windows, seamless doors, sand colored accents and smooth edges. Designed to allow the public an inside look into the movie industry by displaying historic film memorabilia, the Academy Museum of Motion Pictures in Los Angeles is the ideal space for conveying the power of movies. Attendees will explore the art and science of the silver screen by taking in six floors of history, attending events, and watching screenings in a 1,000 seat theater. The theater sits in a glass-topped dome connected to the museum with glass bridges. A rooftop venue is perched between the crystal clear covering above and the state of the art theater below. Like most of Piano’s work, the sphere incorporates a fantastic view with a panorama of Hollywood’s land and city scape. Tragedy struck in Piano’s native city of Genoa when the Morandi Bridge collapsed. Renzo is now taking on the duty of completing a new, reliable but elegant bridge. He is incorporating his continued inspiration from ships by placing generously spaced, thick columns that will make the bridge appear to look like the bow of a ship. The design strikes the perfect balance between strong and slender. Renzo Piano’s list of projects continues to grow giving him more opportunities to display his innovative designs that place him at the forefront of the architectural community.